If you use an Editor Template for DateTime and use the DataTypeAttribute with either or DataType.Date and DataType.DateTime in ASP.NET MVC 2 or 3 and happen to upgrade to ASP.NET MVC 4 be aware! ASP.NET MVC 4 introduces two new internal editor templates for properties marked as DataType.Date and DataType.DateTime to render HTML5 input types (date and datetime accordingly). The unexpected side-effect of this is that if you were previously capturing all DateTime type editing through a DateTime editor template now if your property is marked as DataType.Date ASP.NET MVC 4 will use the new internal Date editor template instead of your DateTime editor template. The solution is to provide a Date.cshtml editor template along your DateTime.cshtml editor template. ASP.NET MVC support for EF Code-First has been there since ASP.NET MVC 3. To jump start playing with Database Migrations start an empty ASP.NET MVC 4 Project and use Package Manager to install or update Entity Framework to the latest version that includes Database Migrations. Add a simple Product Class that represents a product in your E-Commerce Website. Let's intially make Product simple by just providing an Id and Title to it. Run the Add Controller Recipe in ASP.NET MVC 4 to add a Products Controller that uses Entity Framework to read/write to the Database of your E-Commerce Website. Once the Add Controller Recipe is finished you will have a working ASP.NET MVC 4 Website that reads and writes products to the Database using Entity Framework. The ProductsController was created along with all actions and views that display, create, update, and delete products. 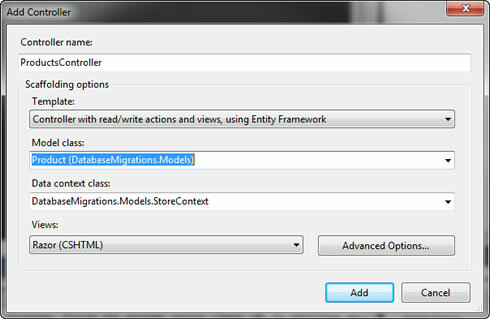 Now we want to enable database migrations to ASP.NET MVC 4 by using the Package Manager Console. 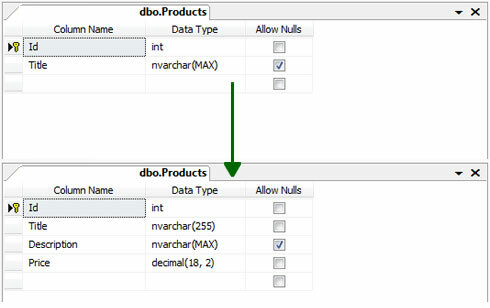 Enabling database migrations creates a new Migrations Folder in your Visual Studio Solution as well as an InitialCreate Target Migration that has both an Up and Down Migration. The Up Migration creates the Products Table while the Down Migration drops the Products Table. Now let's say we want to add more properties to the Product Class as well as make Title a Required Property and a length of 255 characters. One can now add a data migration as well as update the database via the Package Manager Console. The Add-Migration command creates another file in the Migrations Folder of our ASP.NET MVC 4 Project and the Update-Database command updates the database with the new Description and Price Columns as well as modifies the Title Column to be only 255 characters and not nullable. If you look at the ASP.NET MVC 4 Database before and after issuing this Database Migration you will notice the effect. And, of course, the new Database Migration File has the approprite Up and Down Methods.